Michael Clark says Australia can prove themselves as a truly great team on the road against the World No. 1 South Africans next month. CAPTAIN Michael Clarke expects his team to go down in Ashes history, but says Australia must be dominant overseas before they can be considered a great side. Despite having a rare 5-0 Ashes whitewash within reach heading into Friday’s fifth Test in Sydney, Clarke made it clear his side will still have plenty to prove on tour against the world’s No.1 team South Africa in February. Before the Ashes series started, Australia were 66-1 outsiders to win 5-0 but now they’re odds on at $1.60 to become the third team in history to punish England so comprehensively. Clarke has effectively traded places with England counterpart Alastair Cook on an Ashes roller-coaster over the past six months. 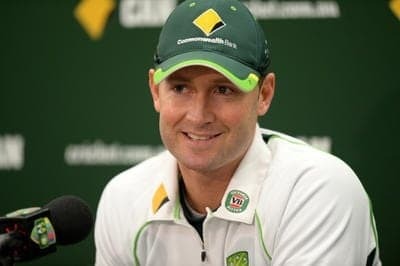 Having taken turns enjoying the spoils of victory on home soil, Clarke says his team must be realistic in recognising that achieving success on the road will be the biggest test of his team’s true quality. “I don’t think it would be wise of us to get carried away,” he said. “We’ve gone from the worst Australian team to ever tour India (losing 4-0 earlier last year) to one of the best Ashes wins of cricket’s history. “We’ve won four Test matches in our own backyard, but it seems in international cricket at the moment a lot of teams are having success in their own backyard. “It’s what you do away from home as well. That’s going to be a huge challenge for us over the next 12 months. Australian cricket has been set back significantly in the past by unexpected retirements, but in a significant boost, Clarke and his in-form deputy Brad Haddin have no intention of riding off into the sunset. There was a rumour floating around that Haddin might hang up the gloves, and many have predicted retirement could arrive prematurely for Clarke, who has battled with a chronic back injury since he was a teenager. Spearheading Australia’s emphatic revival this summer will likely define Clarke’s legacy, but the skipper plans to lead Australia for as long as he’s able, rather than once all the items on his bucket list have been ticked off. Haddin, 36, remains focused on playing through until at least next year’s World Cup, and despite passing 8000 runs and ending England’s three-series Ashes reign, Clarke says he too has unfinished business. “I hope there’s bigger and better things because I’d stop getting out of bed if it wasn’t going to get any better,” Clarke said. “I don’t look at a series or a tournament that seems to be the pinnacle and say if I can have success there (I’ll) walk away.